San Francisco, CA, July 2, 2014 – The 2014 J-POP SUMMIT, San Francisco’s annual celebration of Japanese pop culture, music, fashion and film, partners with SCRAP, the Kyoto-based creators of the innovative Real Escape Game, to present a special interactive puzzle solving game for this year’s Festival. 1000 Treasure Hunters 2014 is a brand new outdoor treasure hunt/puzzle solving attraction that will take place throughout the weekend of J-POP SUMMIT on Saturday and Sunday, July 19th and 20th. Legions of players of all ages are invited to take part in what could become Bay Area’s biggest simultaneous scavenger hunt and search for dozens of clues and puzzles ingeniously hidden throughout Japantown. No special skills or familiarity with Japanese or the Japantown area are needed to play. There is no time limit and players can participate alone, or with friends, or as a team, while simultaneously enjoying other activities at J-POP SUMMIT Festival. Advanced tickets are available now (thru July 18th) for $22.00 each athttp://realescapegame.com/1000th2014; Day-of tickets purchased at J-POP SUMMIT will be $25.00 each. The story and game premise of 1000 Treasure Hunters revolves around a secret kingdom populated by animals living together in Japantown. Once a year they come out and play a concert during the J-POP SUMMIT Festival. But while preparing, they lost an instrument. Now they can't perform without recovering it. Players of 1000 Treasure Hunters must find the clues to find the instrument and help the animals get ready for their concert. Players begin at check-in with the SCRAP Reception Team, located at the Real Escape Game Tent in Peace Plaza, anytime between 11:00am and 3:30pm Saturday, and 11:00-3:00pm Sunday. Tickets may also be purchased on-site at this location. Players each will receive a “kit” containing clues, hints, and a detailed map of Japantown that will become the roadmap for the “game area.” Players should keep their eyes peeled because clues can be anywhere, in plain sight or hidden, both outdoors across the entire Japantown J-POP SUMMIT Festival grounds, Peace Plaza, and also inside immediate buildings. Players may work individually or in teams. As each clue is solved, players/teams move on to the next location where the ongoing mystery leads. Game play is estimated take roughly 1.5 to 3 hours depending on players/teams. 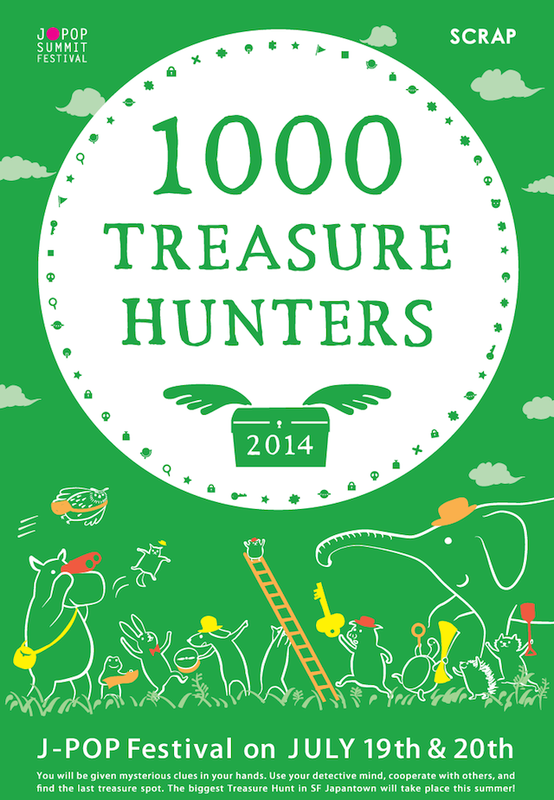 1000 Treasure Hunters is not a ‘fast victory game.’ There is no time limit. No special skills are needed, just astute cognition skills and a keen sense of logic. On the second day of the 2014 J-POP SUMMIT (Sunday, July 20th), a special solution debriefing will be held at 5:30pm as the finale of the game. All of the puzzle mysteries will be revealed in public to festival attendees. During this finale, a special ceremony will take place at Peace Plaza Pagoda Stage where the Grand Prize Treasure winner will be chosen in a random drawing from amongst all of the players that successfully completed the game. The annual J-POP SUMMIT is FREE to attend (although certain attractions do require a modest admission fee) and has become one of the largest events in the United States dedicated to showcasing the many sides of Japanese pop culture and fandom. Full details are available at: www.J-POP.com. Headquartered in Kyoto, Japan, SCRAP has been creating immersive and adventurous puzzle events. In 2007, it invented the world’s first live action game called, REAL ESCAPE GAME (REG) in Japan. REGs have been held in Japan and other Asian countries in unique places such as schools, abandoned hospitals, amusement parks, stadiums, and churches, and the events have drawn widespread attention and positive reviews.